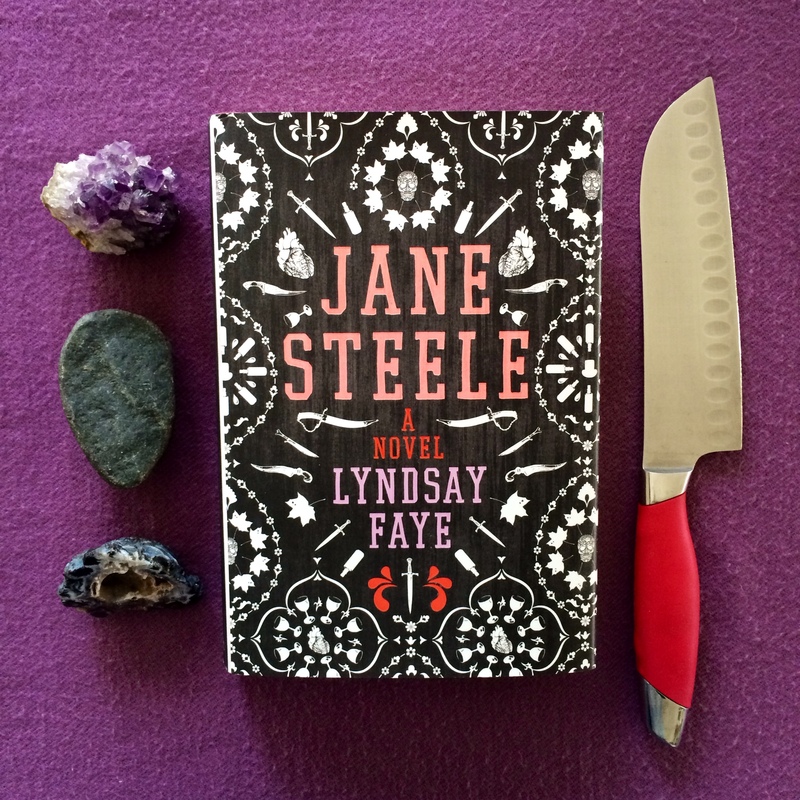 Reader, I adored Lindsay Faye’s Jane Steele*, a wickedly delicious riff on Jane Eyre (which is my favorite novel) recommended by Rory and Kay (a few possible spoilers in the latter review). Having read and enjoyed Charlotte Brontë’s novel (though she does have suggestions for its heroine, like taking the pearl necklace with her so she can afford to feed herself), Jane Steele, self-confessed black-hearted murderess, sets out to write her own autobiography. There is no practice more vexing than that of authors describing coach travel for the edification of people who have already traveled in coaches. As I must adhere to form, however, I will simply list a series of phrases for the unlikely reader who has never gone anywhere: think eggshell dawn-soaked curtains stained with materials unknown to science; rattling fit to grind bones to powder; the ripe stench of horse and driver and bog. Now I have fulfilled my literary duties, I need only add that other girls traveling to school may not have dwelt quite so avidly upon the angular faces of police constables as I. Though she arrives at school already, she thinks, a hardened murderess, Jane Steele is unprepared for the horrific conditions imposed on the pupils by the malicious headmaster Vesalius Munt. As you can see from that last example, Ms. Faye has a talent for names, which frequently seem worthy of Dickens. She dedicates the novel to Nicholas Nickleby and Jane Eyre, and I found myself laughing at many of her Dickensian touches. The detail in the book is a pleasure to read, not only in the references to nineteenth-century peculiarities of dress and decor, but also in lines like “The December morning had been frigid, a pristine lace veil draped bridelike over the grounds” (and another nice Jane Eyre reference there). After leaving a (short) trail of her tormentors’ bodies in her wake, Jane sets out for London with the one friend she’s acquired at school, a girl called Clarke. Together they use the skills they learned at Cowan Bridge (thievery and lying) to survive, and then Clarke’s lovely singing voice and Jane’s talents at writing macabre broadsides win them a roof over their heads and regular suppers. I thought the London section of the novel—such a departure from Jane Eyre‘s settings—was quite good, and wished only that it had been a bit longer to flesh out more backstory. Eventually, Jane learns that a governess is wanted at Highgate House, the manor where she grew up, and which she believes may be rightfully hers. She takes a pseudonym and presents herself to Mr. Sardar Singh, the butler, her new protege, Sahjara, and Mr. Charles Thornfield (of course), a wild-maned, glove-wearing, sardonic veteran of the Sikh Wars (a hero in the Byronic vein if ever there were one). Jane finds herself not only attempting to solve the mystery of her own origins, but also determined to learn more about the unusual household and its gruff master she comes to love more and more. Jane Steele is wildly improbably (like Jane Eyre), ripe with black humor and occasional bouts of gore (unlike Jane Eyre), and a treat to read—“rollicking” is the word that leaps to mind. Jane may be a murderer, but the men she kills all richly deserve their untimely ends, and you may find, as I did, that you rather wish she’d pull her knife one more time before the end of the novel. She’s a plucky, brash, hilarious, and sincere; a worthy successor to Jane Eyre, a heroine for the original’s friends and foes alike. I’m delighted to recommend Jane Steele. P.S. If you can’t get enough Jane Eyre fare, check out Patricia Park’s Re Jane, a modern retelling. P.P.S. If women taking just vengeance on terrible men is your thing, check out Dietland, by Sarai Walker. I quite wanted to read this anyway but as usual your review as assured me I should! This sounds fantastic. It’s a romp–hope you have as much fun reading it as I did! This sounds hilarious! I am putting it on my TR list. I am in the middle of re-reading Jane Eyre which is good timing so I can catch more of the references. Thanks for the other 2 recommendations as well. Ah, then this is perfect timing! Enjoy! I hope everything is going well–we’ve all missed you! Thanks, Carolyn! I’m doing okay, but struggling to find time and mental focus to blog 😦 I miss you all!! Wasn’t it good? I just loved it. You can imagine my delight when I realized my library already had this book (so rarely happens here), and it is now sitting on my windowsill waiting to be read. I can’t wait! YES! Score one for Naomi’s library! Have fun! Horatio helped with the photo by offering his “scariest” rocks. Just clicked through from Elle Thinks and had a lovely half hour reading past posts. 🙂 Love the sound of this novel so much. My reading has been so serious lately! This sounds like it would lighten the tone. Thank you, Victoria, for stopping by and reading! And yes, Jane Steele is–despite a bit of gore–a ridiculously fun romp.